The misting nozzle is made of a sturdy brass with stainless steel orifice. Widely applied for garden, patio, greenhouses, spraying disinfectant, dust removal, landscaping, lawn misting systems, artificial fog and other humidification place. The misting nozzle can use liquid pressure to form a very fine mist, excellent misting effect, energy and water saving, low cost, good effect, no leakage. The misting performance is excellent. This type of nozzle is applied in the low pressure for-making. Leak-proof, durable; Excellent mist effectively strengthen humidification effect, perfect for misting application. Create fine mist droplets that flash evaporate and cool the air almost instantly. The nozzle heads can be easily screwed into any 10/24 UNC threaded mist nozzle opening. MATERIAL: The misting nozzles are made of brass with stainless steel orifice, anti-rust, durable, leak-proof, best choice for outdoor use with cold water. DIMENSION: Thread size is UNC 10-24; Orifice diameter is 0.4mm. 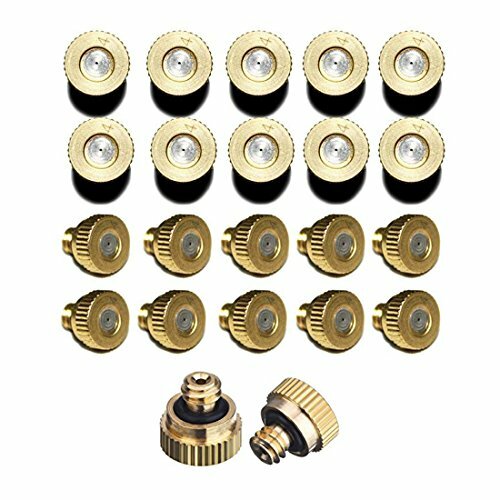 PACKAGE: 22PCS Brass Misting Nozzles For Outdoor Cooling System. WIDE USAGE: The misting nozzles is widely applied to outdoor cooling system, agriculture irrigation system, green house, spray disinfection, epidemic prevention, deodorizing air purification, landscaping, small fountain, etc. EASY TO INSTALL: The brass misting nozzles are easy to install, which can be easily screw into any 10/24 UNC threaded mist nozzle opening.